Hello everyone! We have another great interview for you today! Please welcome author Rhonda Whitaker who will give us a sneak-peek of her new children’s book Uh Oh Baby! Be sure to tune in & enjoy! Rhonda Whitaker is a Master’s level practitioner in the field of developmental psychology. She has over 25 years of experience working with children through adults with diverse developmental needs. She has a passion for making a difference in the lives of children and continues to learn from all those who touch her life. Rhonda lives in Phoenix, Arizona with her husband and two children, and hopes to never be out of touch with her inner child. In this episode, Rhonda & Jed discusses her book, importance and values of parents being present for their kids, how playing with kids & being engaged with them also create loving bonds and cherished memories. Rhonda also talks about her upcoming book & more. Listen to this episode & enjoy the universal “uh-oh” moments of all babies! Uh-Oh Baby! 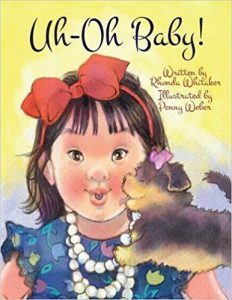 is a children’s picture book written by Rhonda Whitaker and illustrated by Penny Weber.Uh-Oh Baby! is a baby bedtime story that provides parents and babies a special time for shared learning experiences and loving cuddles. It celebrates the wonder and the delight of “uh-oh” moments seen through the eyes of sweet infants and toddlers as they learn about their world. This charming picture book shows the “uh-oh” moments that can occur throughout a baby’s day; including mealtime, bathtime, and playtime! Spend some quality time with your little one while learning that “uh-ohs” can be endearing and good fun. Be sure to check out the review of Uh-Oh baby! on our website. PreviouslyWelcome To A World Of Wonders!! !